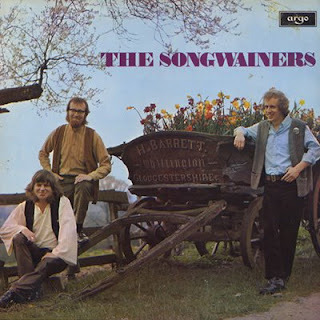 This I believe was the only recording of the Songwainers from Cheltenham - but what a classic. Their setting of John Barleycorn (to the tune of We Plough The Fields And Scatter) has now entered the tradition. One of the finest harmony groups of the 60s and 70s. Sorry the quality is not up to my usual but the songs really do make up for it. Many thanks Reynardine. You are a star. I heard this record at someone's house in Market Harborough in 1973, and have been looking out for it ever since. This stuff is soo up my alley! From the first track on, everything was GOLD. No need for me to listen - see the man on the cover, second from the left? That's my late grandfather. Great to see someone who knows of the band. Anonymous. That was my house in market harborough. Great unaccompanied harmony singing - great trad songs - sheer bliss. I remember dad (Dave) joking that the Albion Band had nicked one of their songs - including the 'bum' notes they played at the time. Ironically, as I got older I realised that I really liked folk / folk rock. Heaven forbid I'd ever admit this to dad, tho. !